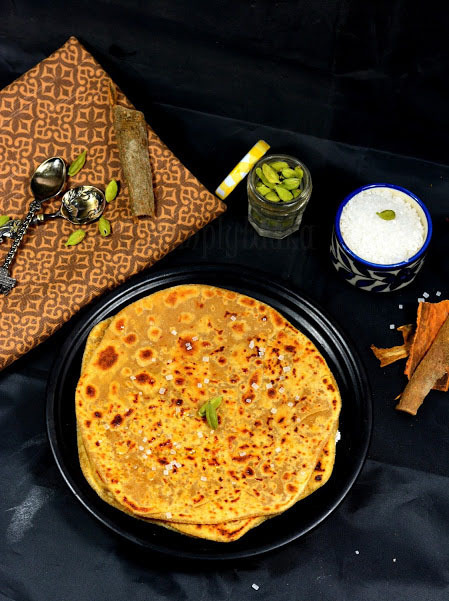 You are here : Home / Besan Masala Roti / Breakfast / Indian Breakfast Recipes / Parathas / Recipes / Roti / HOW TO MAKE BESAN KI MASALA ROTI RECIPE ? Looking for alternatives for simple roti & parathas ? Do you know Gram flour can be used in a lot of Indian dishes? 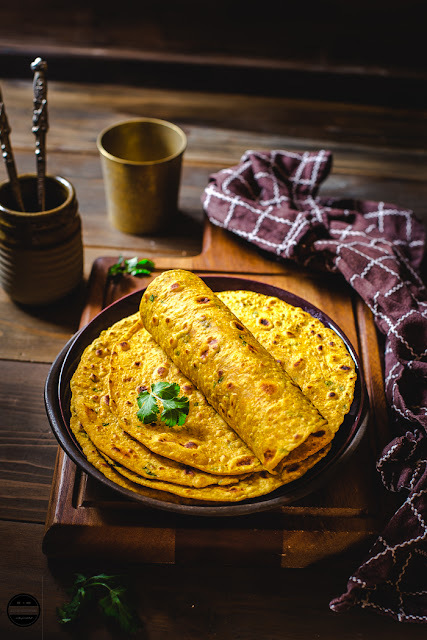 Try this besan masala roti – made of gram flour also called as besan in hindi, a staple in Haryana, a northern state in India. A gluten free option is also available. Read the post for knowing more options. Rotis and Parathas are a very common affair throughout the North Indian states. Each state make rotis and pararathas according to its locally available ingredients and produce. They are interlaced with their regular meals and it is not complete without rotis. Besan ki masala roti is from the Haryana state in northern India. Haryana is also called the “Land of rotis” as it is more common in the local cuisine than any other state. Also rich in agriculture and cattle, it has enormous production of diary. Butter, ghee, milk and curd are in abundance. Generally, we add wheat flour (atta) in all our rotis. The gluten helps in the rolling and gives a softer roti.In the original recipe, I have used 1:1 ration of besan : wheat flour. You can also use 0.5 : 1 ratio. Be gentle while you roll as it might break. The dough will not be pliable nevertheless it is so tasty. To make it gluten free, you can use cooked and mashed plantain or potatoes or even sweet potatoes in this recipe. You can avoid yogurt from the recipe and you will need less water to knead the dough. Again, it will not be pliable. Roll it gently or you can spread them using your fingers. Keep the dough in between parchment paper or any non sticky surfaces and gently pat them into a disc, as thin as possible. You can also use finely milled chickpea flour instead of besan flour to make besan masala roti. Looking for alternatives for simple roti & parathas ? Do you know gram flour can be used in a lot of Indian dishes ? 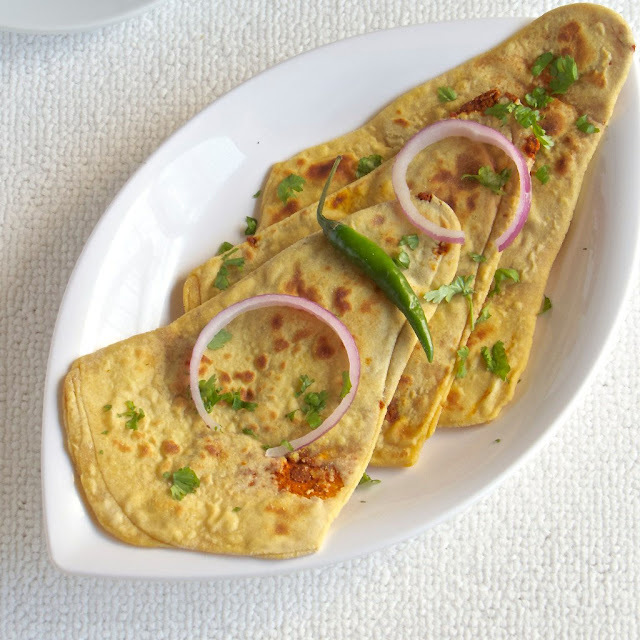 Try this besan masala roti - made of gram flour also called as besan in hindi, a staple in Haryana, a northern state in India. A gluten free option is also available. Read the post for knowing more options. 1.Add the flour, salt, ajwain and turmeric powder in a mixing bowl. Mix well. Add the curd, and then sprinkle water little by little to form a slightly firm dough. Rest it for about 20 minutes. 2.Mix all the ingredients mentioned under masala filling and keep aside. 3.Take the rested dough and divide into 8 portions. Take a portion and flatten it slightly. Dust some flour on the rolling surface (minimum flour as needed) and some on top of the dough. Roll it out into a small disc (approx 3 cm). 4.Brush the surface with ghee and sprinkle the masala filling evenly. Then you can fold this into a triangle or a circle. Fold it into half. Fold again from one side to another to for a triangle. Refer the stepwise pic. Now roll the folded triangle as thin as possible. 5. (2) Start rolling the disc into a cylinder with the stuffed masala inside. 6.Heat the griddle | tawa on medium heat. Once it is hot, place this on the tawa. In 10-15 sec flip it. Apply some ghee on top and then again flip it and apply ghee on other side. Now cook both sides until brown spots appear and it may slightly puff. 7.Follow the same procedure with the remaining dough. 8.Serve it immediately with a spicy side or a simple yogurt. 1.Besan has a tendency to stick. 2.Do not fill the entire roti with the masala. It may be difficult to fold and roll it out. Start from the centre and spread it out. Also apply as much masala as you want. Calories mentioned are for 1 medium sized roti and are approximate values.